This will give you a local branch named fgplot (tracking topics/fgplot), so that you can easily pull/push changes. When pulling, it makes sense to pull with --rebase. 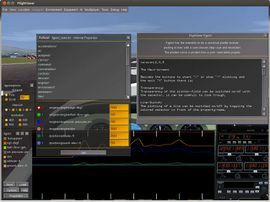 The fgplot dialog can be found in the Equipment menu. Note: The code is currently being revamped, so if you're interested in working with it, it would be better to use the latest version . Provide a built-in plotting tool to help with autopilot/FDM tuning, and other efforts that profit from native plotting capabilities. kuifje09 is now working on an updated version of FGPlot, called "FGPlot 2" which will be implemented using just Nasal scripting and the canvas subsystem, as a Nasal submodule. After 3.2, FGPlot should benefit from being turned into a Canvas Widget, so that it can be easily reused in other dialogs. FGPlot is being developed as a conventional XML dialog, for the time being with a <canvas> section for 2D rendering. Once PUI will be phased out, this will be ported to use a native canvas window instead. To FlightGear, fgplot is just an XML file with embedded Nasal code. I was just thinking today that it might be cool to have a built in grapher for simple / quick graphing needs. With the property system it would be trivial to pick an arbitrary property from the property tree and graph it over time -- superimposed on top of everything else. Things get a bit trickier if you want to control scaling, how much time history get's graphed, multiple values, etc., but even graphing a single value (or maybe just two values) over time could be of some use. I thought I'd toss this out there in case someone thought it was worth while enough to tackle. As a side project I'm working on integrating a 'commercial' fdm with FlightGear via a network interface. One of the things this code supports is control loading. The hardware guys are chomping on the bit wanting to know what range of values the software is going to kick out. Something like a quick and dirty embedded graphing program would be pretty nifty. "cout" probably works just as well, but it's not as pretty. :-) And once you had the basic graphing mechanism in place, it would be trivial to let the user specify which property(ies) to graph. Maybe we could even hook up the GUI prop-picker to specify which values we want rather than forcing the user to type them all in. FWIW, I think it's important for the FDM guys to frequenty fly their code in real time. In real time with visuals attached, various incorrect effects and behaviors can really jump out at you ... stuff that you'd never notice when looking through tabular data, or even a graph. Sometimes the trend is correct, but the scale or the sign is way off. I would think that being able to fly in real time, and see some key graphical data output would be an immensly useful debugging tool. we can spend all day pointing out situations where realtime graphing wouldn't be helpful, but if there are some situations where it would be helpful, and in fact preferable to post processing, then doesn't that make it worth doing? Sure, you could use it to graph the value of any flight gear property over time ... not just FDM values. This could be useful for all sorts of stuff ... debugging panel actions, 3d model animations, environment modeling, etc. ↑ Curtis Olson (Fri, 08 Mar 2002 07:43:35 -0800). idea ... (?). This page was last modified on 28 February 2016, at 15:30.